Got a few more games in with Frankie this last Friday. He was nice enough to head down to my place so I didn't have to make the trek this week! His Spacewolves are a pretty interesting list. It consists of Logan with MM Longfangs in a drop pod, 3 TW Calv, 3 TW Lords, two 5 man grey hunters, one Razorback, and one Missile Long Fang squad. Not a lot of troops, but some hard hitting Calv and of course crazy Logan on turn one with relentless MMs. This game was single objectives and long table edge. I think I went first. My shooting was pretty good but his TW Calv are truly horrible to try to get through. My marshal bike moved around the flank to deal with his reserved troops and Long Fangs (that had also been shot once the calv made CC). His Calv killed off just about everything but could not connect with my two 5 man squads on the second level. I think the game ended on 6 with him having about 3 wounds left on his 2 lords. Had the game gone on MAYBE I could have had enough firepower and my Marshal could have finished them but the way that game had gone... probably not! Next I decided to bust out a Bike army I had picked up off of Frankie a few weeks ago. It was a deal I couldn't refuse. I figured now was a good time to bust them out and get the tips and tricks of the army from the previous owner. This game was again his SW vs Marine bikers! The army is pretty much all plasma bikes and MM attack bikes. Pretty straight forward. 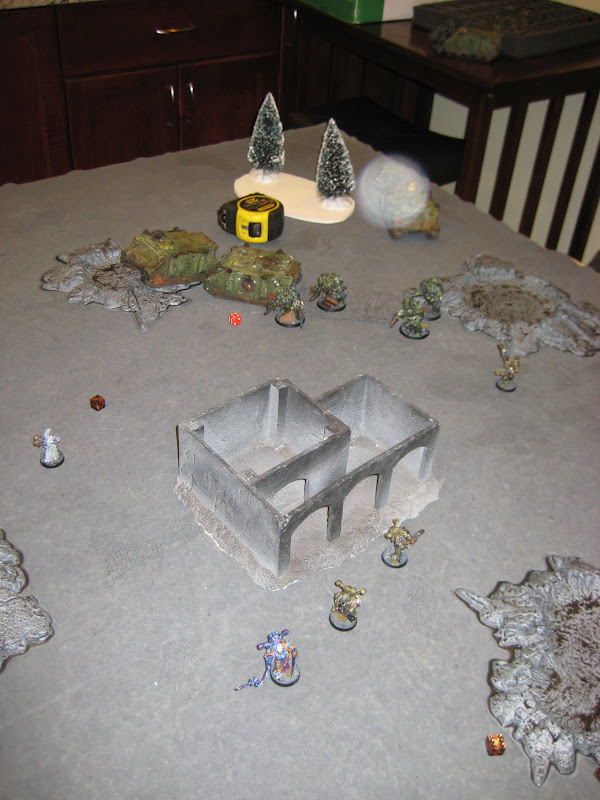 It was dawn of war and multiple objectives. I felt pretty good about this as he only had the two grot squad and I combat squaded down to 8 scoring units! This is at the end of turn 1 since we both basically 'walked' on the board. I made few mistakes this game which isn't surpring given it was my first time running the list. But I also had some horrible morale failures (both to not break as well as to get away with combat tactics). I think we played this through turn 5 and the game ended, even though we pretty much knew once my last troop squad broke on turn 4 it was over. My need to get into 24" was a big bane for me as it meant the TW Calv were generally able to get charges and just own my, plus lords have a good init so I can't reliably break from combat. Wanting to get another game with the bikes in Frankie busted out his Nurgle CSM. This time it was kill points and corner deployment. In this game I started off strong by getting some easy rhino kill points but things swung poorly for me later. Oddlly much like the SW list my need to get within 24" also made this tough because I could be lashed. Once I would get in combat I basically could not kill PMs, and the lash sorc meant it was near impossible to get away. Had the game ended on 5 surprisingly I think it was a tie. But it wasn't, and I got tabled! So the bike list is fun and interesting, but it does feel like it is missing 'something.' It has 4 full bike units as troops, but I have to wonder if getting one 'combat' command squad instead would be worth while. Some Storm shield/TH bikes might have helped with the wolves, and certainly would have been great against the PMs. Of course just have a fist on the sargs instead of the CombiPlas might have been enough to chew through them slowly as well. So I'll need some more games with the bikes but likely this army wont see any real love (both in restructuring or paining) until the dawn of 6th edition. So I got a bit beat up on Friday but it was good fun! The next two weeks I'll be busy so sadly no games for me, though I'm hoping to get a bit of paining done this week.